It’s been 35 years since Tom Eyen and Henry Krieger’s Dreamgirls opened on Broadway, and although it won six Tony awards, has been revived across the globe, and was even turned into a successful film starring Jamie Foxx and Beyoncé in 2006, it has never set foot in the West End. Until now. Casey Nicholaw’s production at the Savoy stars Amber Riley, of Glee fame, as Effie White, lead singer of wannabee superstars The Dreamettes. Alongside her on the journey from Illinois obscurity to chart-topping success are Liisi LaFontaine, Ibinabo Jack, and Tyrone Huntley, who stole the show as a James Brown-esque Judas in Jesus Christ Superstar this summer. Despite insistent denials, it’s widely thought that Eyen and Krieger based their musical – a rollicking tale of ambition, integrity and betrayal set to a thumping score of R&B and disco – on the real-life story of Diana Ross, Florence Ballard and The Supremes. 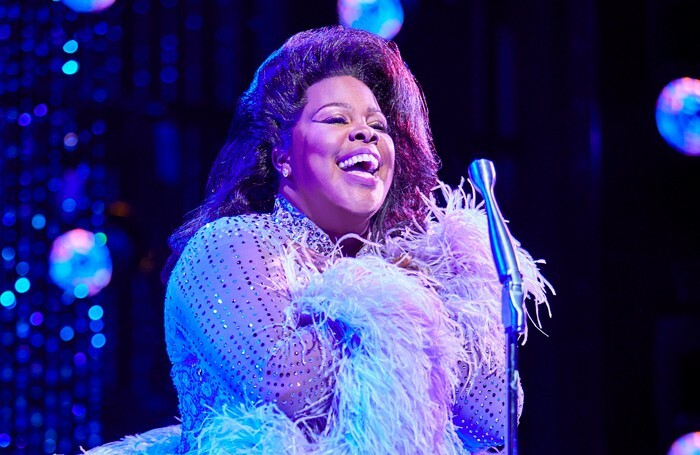 But whatever its origins, Dreamgirls has conquered the rest of the theatrical world over the past three and a half decades, and London’s critics have turned out in their droves to assess whether it has successfully planted its flag in the Strand as well. Can Nicholaw’s production live up to the mythical magnificence of Michael Bennett’s 1981 Broadway original? Can Amber Riley look former Effies Jennifer Holliday and Jennifer Hudson in the eye? Can the Savoy survive the sonic sandblasting of Henry Krieger’s score, turned up to eleven? The design of the original Broadway production – with five giant, mobile towers of lights shifting across the stage – has gone down as something of a classic. As Mark Shenton (The Stage, ★★★★★) remarks, “Michael Bennett’s original 1981 staging remains indelible – in my memory, one of the greatest Broadway productions I’ve ever seen”. How does Nicholaw’s effort compare? Pretty well, it turns out, as set designer Tim Hatley has closely figured Bennett’s blueprints, preserving the prowling light towers and allowing them to progress the action from recording studio to concert venue and beyond. Edward Seckerson (The Arts Desk, ★★★★★) agrees, opining that Nicholaw, Hatley, and the rest of the creative team “deliver in spades some jaw-dropping spectacle”, and marvelling at the design’s “apparent simplicity and sparseness”. And, as you might expect from a choreographer-director, everything flows with slickness and style. 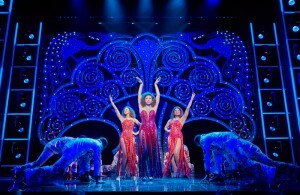 Or, has Henry Hitchings (Evening Standard, ★★★★★) puts it, Dreamgirls boasts “choreography tighter than a lobster’s shell”. Dominic Cavendish (Telegraph, ★★★★) concurs, delighting in “synchronised dance moves that conjure some of the silliness as well as the sexiness of the Sixties and Seventies”. Not all are swept up in this tidal wave of dazzling lights and winking sequins. As she picks glitter from her hair, Ann Treneman (Times, ★★) dismisses the whole shebang as “uneven and rather like a talent show itself, with every song seeking to top the one before, every costume striving to up the disco-ball sparkle”. Dreamgirls is one of those shows: even if you haven’t a clue about the musical, you probably know the music. So how do these familiar tunes come across in Nicholaw’s production – dispiritingly dated or bona-fide bangers? Shenton is less equivocal. 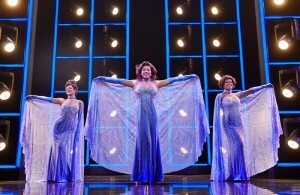 For him, Dreamgirls flaunts its “magnificent parade of original hits” all night long. He finds “a propulsive symphony of melodies that are stunningly played by a pit band under the baton of Nick Finlow”. “It felt as if we were all under supersonic attack”, chimes Treneman. So what about performers assaulting Treneman and Letts with their voices? Do Riley and her supporting cast impress? On the whole, yes. Riley, in particular, is showered in praise. For Dom O’Hanlan (London Theatre, ★★★★★) she “gives a performance of a lifetime that’s unlikely to be bettered by any other modern performer in the role”. For Paul Taylor (Independent, ★★★★), she provides a “blazing powerhouse performance”. And for Aliya Al-Hassan (Broadway World, 5 stars), she is “brilliant, showcasing a spiky and spirited attitude with which you could cut glass”. Matt Trueman (Variety) writes that Riley has “a weapons-grade voice, the sort that flattens audiences like a blast wave”, while Sarah Crompton (What’s On Stage, ★★★★) simply reflects that Riley has the power to “blow your socks off”. Most laud the rest of the cast as well. LaFontaine and Jack provide “charming, sensitive work” as Effie’s fellow Dreamettes, according to Hitchings, and Huntley is “soft and gentle, if a little one-dimensional” as her songsmith brother, according to Al-Hassan. But Treneman again goes against the grain, considering it “impossible to feel attached to these cardboard cut-outs, only amazement at their voices”. And Saville again concurs, admiring the “astonishingly good” Riley but expressing disappointment over her “uneven supporting cast”. 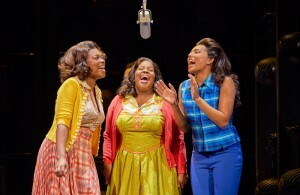 Dreamgirls – Is it any good? Judging by the number of five star ratings it’s hauled in, it is. Most critics are blown away by the design, the costumes, the choreography, the score, and Amber Riley’s stonking central performance. Demetrious Matheou (Hollywood Reporter) speaks for most when he asserts that “Casey Nicholaw’s zestful, spectacularly entertaining and at times overwhelmingly stirring production is irresistible”. There are naysayers, though, Treneman and Saville among them, who see through the shimmering showbiz chic to the drama beneath, and aren’t impressed by what they find. And there’s far more discussed elsewhere than summarised here, from the deficiencies of Eyen’s book to the show’s inattentiveness to R ‘n’ B’s racial context, from the current diversity on the West End stage to the rise in mid-show standing ovations – a bug-bear for many. Dreamgirls may be a success, but it’s certainly not an unqualified one.